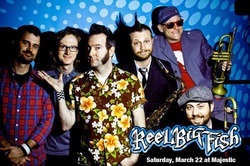 SoCal ska-punk legends Reel Big Fish return to Madison for a SOLD OUT SHOW this Saturday, March 22nd, at The Majestic Theatre! If you failed to grab your tickets before hand, we have one more chance for you to see the show!!! Simply follow the rules below and you could win a ticket, PLUS 1, to see this amazing band!!! 1) LIKE WIJAM, if you haven't done so already. 2) LIKE & SHARE this contest. 3) COMMENT below to confirm your entry. That's it!!! We'll pick ONE WINNER, who will receive TWO TICKETS on Saturday afternoon!!! Good Luck!! !